The Zetas have long stated that magnetic trimesters exist, ending at approximately the end of December, April, and August. The strongest of these is the Summer trimester. Since magnetism is viewed as polarized, a N Pole and a S Pole, with particles flowing from one to the other, the idea that there would be trimesters is confusing. We have explained that the Sun's magnetism reaches to the ends of the solar system and beyond, and dominates. Mercury and Earth, for instance, align with the Sun's permanent alignment, and for those who say the Sun flops about, reversing fields every 11 years, NASA's own Ulysses probe proved them wrong in 2001. Imagine the solar system itself aligned along a magnetic flow line of a larger field, which pulses. It is no accident that the Earth, a magnetic planet, is going round the Sun every 365 days or so, as the magnetic trimesters have something to do with this progression. Why is it the Sun, as the giant magnet dominating the solar system, points North and South with its poles in the directions it does? For those late to this argument, the Sun does not reverse polarity every 11 years as NASA states, and the solar magnetic field reaches beyond the outer bounds of the solar system, affecting all the planets. The Sun likewise is under the dictates of influences that surround it, and as the Sun goes, so go the planets. 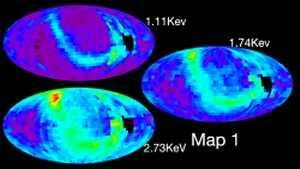 In October, 2009 NASA's IBEX provided its first map of a newly discovered magnetic ribbon just outside the heliosphere. These maps were provided every six months, with a second provided Spring of 2010 and the third just recently in October 2010. NASA is declaring that changes occur within the magnetic ribbon within a six month period. They are not sure of the exact timing, as they only get a map every six months, but they are sure that the change happened with a six month period! Knot in the Ribbon at the Edge of the Solar System "Unties"
The unusual "knot" in the bright, narrow ribbon of neutral atoms emanating in from the boundary between our solar system and interstellar space appears to have "untied," according to a paper published online in the Journal of Geophysical Research. Researchers believe the ribbon, first revealed in maps produced by NASA's Interstellar Boundary Explorer (IBEX) spacecraft, forms in response to interactions between interstellar space and the heliosphere, the protective bubble in which the Earth and other planets reside. Sensitive neutral atom detectors aboard IBEX produce global maps of this region every six months. "[The ribbon is] aligned by and dominated by the external magnetic field," McComas said in a briefing Thursday. "That's a huge clue as to what's going on. 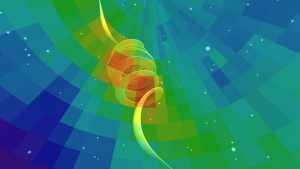 But still we're missing some really fundamental aspect of the interaction - some fundamental physics is missing from our understanding." The new IBEX results will be published in the Oct. 16 issue of the journal Science.